It took Michigan until March 13th to win their 10th game last season. This year they have already reached the 10 win mark before the conference season has tipped off. 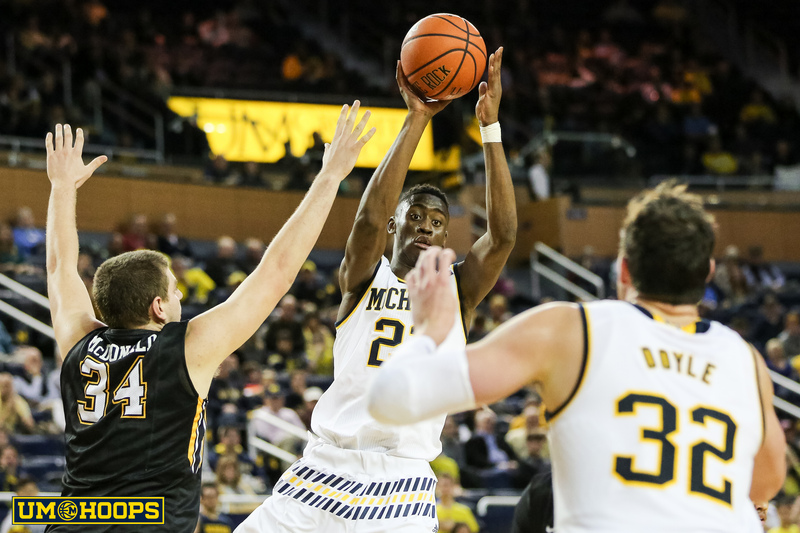 Last year’s struggles against teams like Central Michigan and Harvard are nightmares of the past and now it appears that Michigan is poised to make a run at the NCAA tournament. Tonight’s game felt like one that everyone knew we just had to get out of the way before Wednesday’s Big Ten opener. Michigan came out and got an early lead before falling asleep at the wheel. North Carolina Central gave them something to think about at halftime and Michigan responded as the lead ballooned to 20 points before falling asleep again. It’s frustrating to let teams hang around and I think this can come back and bite us but in the end a win is a win and North Carolina Central never really had a chance to win. Manny Harris had another dominating performance with 29 points, 16 rebounds, 7 assists, and only 1 turnover. He definitely forced the issue a couple times early in the game but I loved to see him get in the lane in the second half. I think Manny had been settling for jumpers rather than taking it to the hole in recent games and Michigan is going to need his production at the free throw line in conference play. The rotation still seems up in the air, especially at the power forward position. Shepherd started the game at the four but wasn’t very productive in the first half and Novak started the 2nd half. Jevohn did come in and give Michigan a boost with 2 put backs when Michigan was in a bit of a funk. Anthony Wright got a stint off the bench when Novak picked up his third foul but it seems pretty clear that he is getting cut out of the rotation. Novak, Gibson, Shepherd, and Wright are going to play the minutes at the four and Michigan really needs that second guy to step up and be a contributor. Michigan had a poor day shooting the ball but held North Carolina Central to an even lower percentage. Rebounding was a wash. Michigan won the game by holding onto the ball and getting to the free throw line 25 more times than the Eagles. Michigan shot well below their season average of 80% at the stripe as well and only made 20 of their 30 attempts. The final thing that’s frustrating about tonight’s game was that our RPI fell from the mid teens all the way to 37th. Our strength of schedule also took a huge fall down to 87. The Big Ten season will help the numbers but a game like this shows why it is so important to play teams that are going to fall in the 100-200 RPI range rather than the 300+. DeShawn Sims: Peedi tweaked his ankle in the first half and went to the locker room to get taped up. He came back and still played most of the game although he was definitely gimpy in half time warmups. Peedi had a solid game with 17 points, 9 rebounds, 2 assists and 3 steals. Peedi had 6 turnovers though and a lot of them were pretty rough and led directly to NCC points or were blown easy opportunities. Laval Lucas-Perry: Laval is a 2 guard. I was always skeptical of all the talk that LLP would be a point guard on this team and thus far he has played strictly 2-guard and has zero assists through 3 games. LLP can definitely shoot it though and hit his first three triples today. I’m not sure what happened on his late botched layup on the dime from Manny, he must have been surprised to have the ball land in his lap. Stu Douglass: 17 minutes, 7 points on 3-8 shooting (1-5 3pt), 1 rebound, 1 assist, 0 turnovers. I was surprised to see that Stu took 8 shots but I think he looks more confident on his shot than he did when he went through a bit of a drought earlier this year. Zack Novak: Novak picked up some cheap fouls and was limited to only 17 minutes. If Zack is going to play the 4 he is going to need more than 1 rebound in a game though. Kelvin Grady: Kelvin shot 0-4 but this is becoming his team. He is getting a lot more minutes than Merritt and this time and is doing a great job holding onto the ball and finding open teammates. Kelvin had 4 assists and 0 turnovers in 27 minutes. Kelvin has only 9 turnovers in 12 games. Dave Merritt: Dave is seeing his minutes dwindle and was pulled less than a minute into the second half. Merritt is able to run the team but Grady is going to play more and more. I still don’t have a problem with Dave starting as long as Kelvin is playing more minutes. Zack Gibson: Zack needs to start hitting wide open three pointers. He had three of them today and didn’t hit any of them. If he can be a little more of an offensive threat it will help make up for his liabilities on the glass. Jevohn Shepherd: Shep was playing really well for a couple of games but has seemed to regress a bit. He doesn’t look as comfortable on his jump shot and at the stripe but he still brings some energy with athleticism on the glass.